Streets like Main and Hastings should function as urban spines linking quartiers on either side along their full length. Traffic volume on the urban spines should not exceed HEAVY volumes, or 20,000 ADT. Reductions from present day volumes will be achieved by BRT/LRT on the urban spines absorbing most of commuter trips, and local trips converting to walking, cycling and transit. Today, residential uses fronting on arterials are not working: high volumes of traffic present overwhelming challenges, including: threat to life, noise, and pollution. Either the cottages trend down-market becoming low-end rentals, or behemoths of super-human scale are constructed—including towers—that turn a back on the street further discounting values of community and values of place. The charrette uses transportation implementation along with the re-design of arterial streets to mediate high traffic volumes; removing car lanes; yet, doubling the trip carrying capacity of the street. Public investment in transportation infrastructure and street revitalization combine at the scale of the quartier with private sector residential intensification to produce the new arterials. The New Arterials will present high levels of performance for both transportation, and livability. By absorbing car trips, BRT on the New Arterials will reduce the negative impacts of high volumes of traffic enabling higher levels of social mixing on Neighbourhood Streets. Traffic volume on the New Arterials should be MEDIUM to HEAVY, between 10,000 and 20,000 ADT. On local streets the volume of average daily traffic (ADT) should not disrupt social functioning, livability or the sense of place for residents in houses fronting the street or pedestrians passing by. According to Appleyard (1981—the source for all the traffic levels quoted here) traffic volume on local streets should be LIGHT to MEDIUM, between 2,000 and 10,000 ADT. Redevelopment on local lanes, typically 20 feet wide, will set back 20 feet to achieve an overall lane width of 60 feet (20 meters). Average daily traffic should be below 2,000 v.p.d. In order to achieve human scale in the build-out of the quartier building height must be set in proportion to the width of fronting street or urban room. Lewis N. Villegas, The Gastown Principles, march 2011. The table above identifies the four street types in the quartier. Column 1 indicates the total width of the right-of-way, including land released as part of redevelopment and rear-lane set backs. Column 2 gives the aspect ratio set according to the principles for human sense perception, or human scale. Column 3 gives the height of the building at the streetwall and lane edge. Column 4 gives the total height of the building. The variation of street width—combined with other characteristics such as the height and continuity of the streetwall, tree planting, transit implementation, etc.—creates a hierarchical ordering in the streets of the quartier. Combined with zero-side yard urban houses these characteristics achieve continuity of the street wall and perimeter block massing, fundamental characteristics in streets that have a sense of place. At the urban block outer edge the built form masses at the property line providing street definition. At the urban block middle the massing of the built form is softer, and more relaxed. Three consecutive streets—Water-Powell, E Cordova and E Hastings—carry a combined vehicular volume of over 64,000 cars per day, cutting a swath of blight across the Vancouver Historic Quartiers. Just a five minute walk south, Prior-Venables streets carry an additional 30,000 vehicles per day (the Prior-Venables change in street name occurs at boundary between the old East End and the Drives; the Water-Powell change in street name happens at the boundary between the old East End and the Granville Townsite [Gastown]). We hear often how in the 1960′s ”We Won the Freeway Fight”. However, the traffic counts presented here paint a different picture. In the historic quartiers, it is more accurate to say that we won the fight and lost the war. Traffic volumes today, and for the past three or four decades, exceed the limits for sustainable neighbourhood functioning. Most trips are commuter trips to the Central Business District. Water-Powell’s traffic shows up in the morning rush, consisting of people driving to work. Cordova’s traffic arrives in the afternoon, made up of people going home. Prior-Venables experience both morning and afternoon rushes. The total of 94,000 average daily trips on four consecutive east-west streets—Water-Powell, E Cordova, E Hastings, and Prior-Venables—is one of the major factors blighting the Vancouver Historic Quartiers. As suggested by Appleyard present-day levels of high traffic volume destroy social functioning in the neighbourhoods, and make conditions on fronting residential uses un-livable. The results of high volumes of traffic on fronting properties are always the same: high volumes of traffic blight neighbourhood places. Similar conditions can be observed along 1st Avenue outside our study area, and along all Vancouver arterials fronted by residential uses. High volumes of traffic result in negative living conditions, threat to health and safety, eroding values of community and down-trending property values. The good news is that we have a way to remove traffic from neighbourhood streets: Implementing rail transit on Hastings Street and bus rapid transit on Main Street (see below). [Note: Traffic volumes are from VanMap dating from 2005 and 2006]. 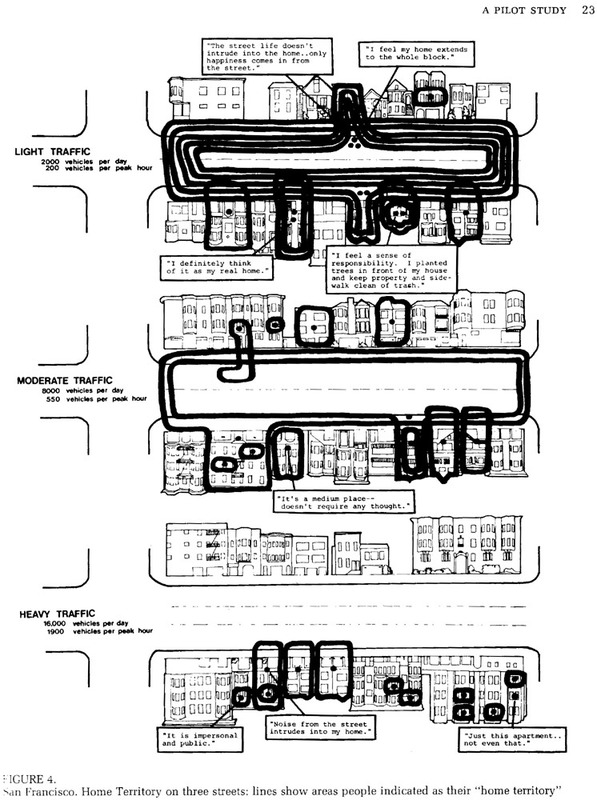 For more than a century we have classified streets by their vehicular carrying capacity—local, collector, and arterial. During this time the traffic engineers have had the final say in all issues involving the design of the public rights of way. Pedestrian uses are barely considered and pedestrian counts not taken. In the design of the quartier, the hierarchy of street spaces inflects to the human experience of place. Ranked according to the resulting quality of the urban environment, the new hierarchy of street spaces is grounded on human sense experience returning comparative advantages for fronting shops, residences and social functioning. Donald Appleyard, “Livable Streets”, 1981. p. 60. In flat, open terrain under calm conditions, street noise and air pollution levels are highest adjacent to the road and decrease with distance from it according to the Inverse-Square Law. However, the shape of the streetwall and the street section distort the effects of pollution and noise. Anne Whiston Spirn, Time Saver Standards in Urban Design. Whiston Spirn’s analysis does not extend to include the presence of street trees. While street trees will not be effective in blocking noise, they provide psychological relief by screening the noise source, and enhance the experience of place. However, urban trees are positive contributors when looking at two pollution issues. The leaf canopy will trap particulates which will fall to the ground in autumn along with the leaves, then be carted away by municipal cleaning crews. Also, as part of photosynthesis, trees will consume carbon dioxides and release oxygen in daylight hours. We were unable to locate any data measuring the scale of this effect, typically referred to as the “carbon sink”. Pollution and noise are “point source” contaminants. If one wishes to reduce by half the amount of pollution or noise reaching a house fronting the street, then one must move the house times further away from the street. According to the Inverse-Square Law, in order to reduce the levels of pollution and noise by one quarter, one must move sixteen times further away from the street. In physics an inverse-square law presents the specified quantity or strength as inversely proportional to the square of the distance from the source. The inverse-square law generally applies when some force, energy, or other conserved quantity is radiated outwardly from a point source. Since the surface area of a sphere (4πr 2) is proportional to the square of the radius, as the emitted radiation gets farther from the source, it spreads out over an area that is proportional to the square of the distance from the source. 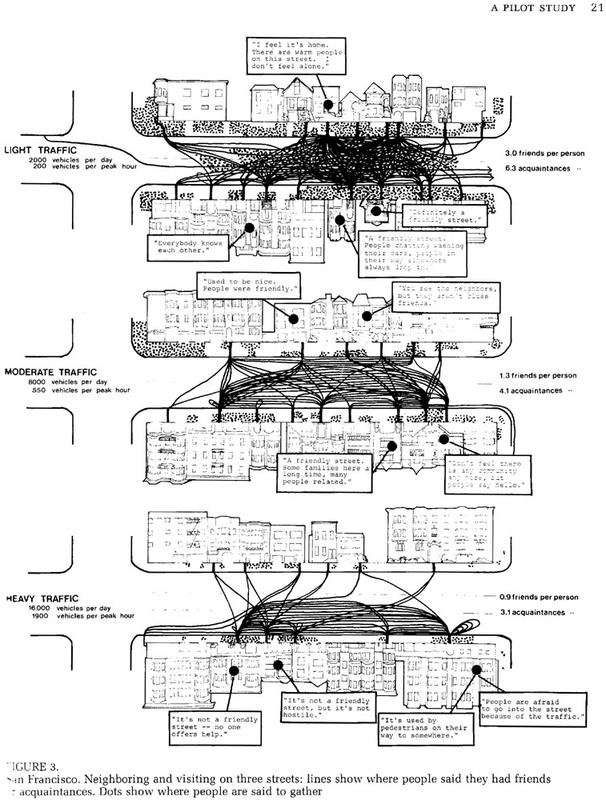 In order to illustrate the negative impact of high volumes of traffic on the social functioning of the quartier, we are summarizing a study completed in San Francisco in 1981. On three San Francisco Streets with light, moderate and heavy levels of traffic volume residents were asked to draw their activities and attitudes about the street environment in front of their houses. In what Appleyard termed “Neighbouring & Visiting” residents were asked to draw a line connecting their door to the door of friends or acquaintances on the block. A direct correlation was found between the number of relationships reported and the volume of traffic. As traffic volume rose higher the level of social mixing dropped significantly. In what Appleyard termed “Home Territory” residents were asked to draw a line around the territory they felt belonged to them, whether it was in actual fact part of their house or apartment or not. The amount of street space identified as “home territory” changed dramatically as traffic volume increased. Residents were asked to identify a distinctive feature on their street. For example, a corner shop window, a piece of sculpture, a particular planting, or other object. The number of times residents could identify a feature found on their street dropped as traffic volume increased. The perceived and real danger of traffic was a concern on all types of streets. However, concern and accident reports increased as traffic volumes rose higher. Results confirm that Appleyard’s findings are applicable within the United Kingdom, specifically that the number of friends and acquaintances on a residential street, as well as the extent of individuals ‟home territory‟ tend to decrease as vehicle traffic increases. Other notable outcomes from the research include the finding that the frequency of stationary, street-based recreational activities is reduced as traffic flow increases, and that individuals perception of the safety of their neighbourhood may be disproportionately influenced by the amount of traffic on their street of residence, especially affecting the degree of independence granted to children. JOSHUA HART UNIVERSITY OF THE WEST OF ENGLAND, 2008.